This unique book showcases local women and how their connection with food has impacted their lives, their communities and even the world. 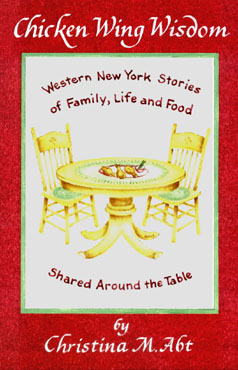 Author Christina M. Abt has penned a collection of stories about 14 Western New York women and their wisdom as it relates to food and nourishment. The tales in Chicken Wing Wisdom cover a range of topics, from the creation and cooking of food, to teaching and counseling on the subject. Among the women profiled are the creator of Buffalo's Original Chicken Wings, the originator of the Subway low-fat brownie, the Broadway Market's Butter Lamb Lady, a food research and development scientist and a certified nutritional counselor. The book also includes favored recipes contributed by each of the women profiled.